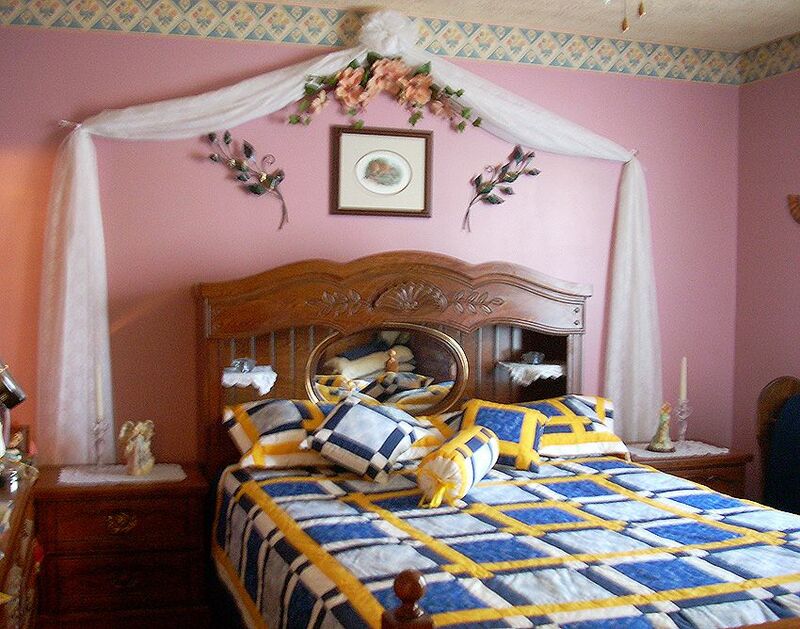 The lovely quilts in this photo gallery were all designed with square and rectangular shapes. You'll find more quilts with a square and rectangular themes in the log cabin quilts gallery and in Novelty and Theme quilts. From Gloria: I made this quilt from a dream I had about walking through a shady park in the beginning of spring, 2011. The size is King/Queen and it has matching pillow shams, two matching 14" square pillows and a matching roll pillow. From Celine: I made this quilt for my daughter and I gave it last Christmas. I was inspired by your Woven Logs quilt block pattern. It was pieced and quilted on my own sewing machine and measures 77" X 77". My daughter's room has some green and everything fits together. A photo of the custom label Celine made for her quilt, Vent d'independance, seen on the previous page. From patchwork_mom: This quilt was made from a piece of orange, yellow, red and purple fabric with a tropical sunset print. I didn't want to lose the picture so looked for months for inspiration that would let me use the fabric. My daughter brought home a library book and a picture of a simple quilt caught my eye. I took down of the idea and made it totally my own. When the quilt was finished, I donated it to a Hospital fundraiser. It fit a twin size bed but laid nicely on top of a queen. From Celine: Last year, I gave for Christmas, to my daughter in law, this quilt made from Janet's Domino quilt block pattern. It's 74" X 84" and was pieced and quilted on my own sewing machine, simple but so nice. I saw diamonds in the eyes of my daughter in law. She was so proud to receive that quilt. Thank you for your block design. Wonder Quilt. Quilt by Susan W.
Susan says: I started out making a "crumb quilt" -- a style that I read about where you take all your little crumbs of fabric and sew them together. You then cut out squares of any size and place them in a pattern pleasing to you to create a quilt. I started out doing that, but when I created a certain piece, I didn't want to cut it up. I started building on this center piece, creating as I went. I used the square pieces made from my "crumb" scraps along the sides of the quilt. I tied it all together with red fabric that I had and kept building borders around everything. Before I knew it -- Voila!!! I had a quilt measuring 63x73. The picture shows the quilt before it was quilted but I am now in the process of hand quilting. It's very bright and I love it! Thrifty says: This was my first quilt. I used king size bed pillows for the green and brown blocks. Terrie says: I am pleased to be able to share this with you, because it really just 'grew' from a few squares that I had already cut. I wanted to make something 'all by myself' with no pattern and use the delightful stash I have begun collecting. When I began, I didn't know what it was going to look like, but here it is! Karen says: I'm a new quilter, so the patterns I select must be simple enough for me to attempt. I tend to select traditional patterns or patterns that are pretty much simply assembled. This quilt is made from blues, greens, purples with a touch of metallic gold running through some of the fabrics. I thought the pattern would be easy; it was. I am drawn to cool colors. As I was visiting a local quilt shop, I happened to spot two fabrics on clearance which became the starting point of the colors in my quilt. The quilt reminds me of the deep blues and teals of the ocean. It's a soothing quilt. From Grama Jones: I purchased the material for this quilt in 2002 and have finally finished hand embroidering the 40 blocks and quilting the quilt in 2010. I will put it away for my future grandchild. From Lisa: I wanted to make my daughter, Zoe, a quilt she could take away to university to remind her of home. She loves lime green and bright colours. I used buttons to tie the quilt all over. This is my first quilt ever, and although I see flaws, I think it turned out well. I made up the pattern myself. Marilynne: All the fabric used in the Work Day Quilt, not including the backing, is from shirts and pants my husband had worn at work. There is corduroy from both a shirt and pants, and the quilt to my dad. At 88, he likes a little extra warmth. I still have enough fabric from the shirts and pants to make another good sized quilt. From Haubon Quilts: This Is a 92 X 98 bed cover intended for Valentines day. The colors used are mostly in red. It took me seven months to finish this quilt, and it was worth it, because it brightens our bedroom. From Mona: This is a strip quilt put together in an "around the world" format. The quilt is made of 6-inch squares that were put together using the quilt-as-you-go method, creating an 84x84 inch quilt. I have a ton of small fabric scraps, which I love, but periodically I have to tame the scrap beast and use them up. I have been wanting to make a quilt in rainbow hues for a while and I finally did it. I really loved the quilt, but I ended up giving it to my mother-in-law for Christmas. I think it turned out beautifully. From Ankie: I saw a book with Amish quilt patterns and liked them very much, for the simplicity of the designs and for the colours. This was my first single bed size quilt, and because it was made up of squares, I thought it would be easy. It was. The quilt was quick to make because the blocks are large. It's a bit small for the bed, but I love it. From Calicosnowman: This was my second quilt. I would change it by using different colors. I didn't use a binding at the time, and just hand stitched the pieces together by hand. It's just not one of my favorites, but I liked the fabric. Note from Janet: This quilt doesn't truly fit the "square" theme, since it includes lots of triangle units, so it might move as galleries become more specific. From Denise The Pink and Orange Four-Patch pattern inspired this quilt, but it turned out to be a completely different block. I used several batiks, including a golden sunflower design that complemented the vibrant print. I may add beading detail before all is said and done. The finished quilt measures 31" square, and blocks finish at 8" square. From Becky: My inspiration comes from the loved ones I make quilts for. This quilt was for Daniel, my great nephew, and it had to be purple and gold to represent his favorite team. It is his "great kid" quilt. From Ramona: I made this flannel quilt for my stepfather. He was in the Veterans Home with Alzheimer's when I made it for him. He passed away this year, and the quilt came back to me. He loved to fish -- that's why I used fabric with fish on it. From CodysNana: This quilt started as two sofa pillows. The pattern was so complicated I never figured it out, but I remembered how to make a 25 square pillow top and somehow it grew into a single bed size quilt, 6'6" x 6'6". I call it "Formal Hoedown," because although it looks country, it does have a bow tie in each block's corner. This is the very first full size quilt I have ever made. It is made with the quilt as you go method because I don't have a quilt frame. I machine pieced it in one-block-wide strips and then quilted each strip by hand before sewing them together. The backing is the dark green fabric with leaves that shows on the font as the border. Note from Janet, The quilt doesn't truly fit into the "squares" theme, but it was a close as I could get to a suitable gallery. From Ramona: I made this a couple of years ago for my Niece in Texas. I picked the colors to match her personality, bold and beautiful. She loves it. From Marilyn: I made this quilt first using a white on white fabric for the Framed 4-patches, and decided that it would look really good with a dark background too. So I made this one. It measures 81" x 104", and is shown on my queen size bed. It fits perfectly. From Marilyn: My grandson loves the Broncos, and even has his bedroom painted in Blue and Orange. My daughter wanted to get him the bed set but it was almost $400.00 -- just a comforter was almost $200.00. That's just too much to spend when you have 3 boys. So we went shopping and got some Bronco fabric and matching colors, and I made this for Damian for Christmas 2008. I didn't have a pattern, just made it as I went, but I think it turned out very nice. It was the 6th quilt I ever made and measures 81" x 105". What really matters is that Damian loves it. From Florence: I have been receiving a lot of good information about quilting which I hope I have used in my quilting projects. I made this graduation quilt for my grandson, who is very musical in vocals as well as instruments. I started the quilt last summer and I just finished it a week ago. I have a rotator cuff tear so it wasn't easy to finish. From Marilyn: I am a beginner at quilting and this is my fourth project. I love Christmas and Christmas fabrics. I had seen patterns for sixteen-patches, and quilts set on-point, and I really liked the looks of them. So I found some patterns, changed them to what I liked, and made my own quilt. This quilt measures 81" x 104". It is shown on my queen size bed, and it fits perfectly. It can be made with all the blocks the same, or as I did with different fabrics. It is a great way to use up your scraps. I decided that it would also look great with a dark background, so I made a second one, with a Forest Green marbled fabric instead of the white. From Gladys: This is my Dream Weaver quilt. I really enjoyed making it and I love the finished product. I think the colours came together really well. It's a queen size quilt, but big enough for a king size bed, too. The quilt measures 100" x 115" with 650 pieces. Jan made this quilt from one of my quilt patterns here on About.com. It's lovely! From Cat-ena: My quilt is from one published in a quilt calendar in 2007. It was designed by Carol Burniston. The cat print fabric was chosen for my younger daughter Julie for her 30th birthday - she is the "mother" of two cats. I had to resize the blocks to work these cats into original quilt - very vibrant and colourful, just like Julie. I was over it by the time I finished making and quilting it. It was exhibited recently at my local group's biennial exhibition. From Lisa: This quilt was inspired by Roy Orbison's 'Black and White Night' live performance CD, and is a gift to my sister who works at White House Black Market. It's approximately queen-sized, and is made of many different black-and-white patterned fabrics, separated by black strips of varying widths. From Terri: I put this quilt together in a week (record for me). It was a secret Santa gift at our Yule celebration in 2006. This was my third finished quilt. Machine sewn and quilted for expediency. This was supposed to be all in blues, my husband suggested the burgundy color. Farah says: This is my first quilt attempt, a floor cushion of 24" x 24". I had a lot of rag cloth strips which I wanted to make use of. The colours matched that of my living room. Sandhya says: This was my first quilt. Rather, it is a quilt top lined with a back. There is no batting in between the top and the back as I live on the west coast of India and we don't have much winter. This, I use as a bedcover. It is made from leftover fabric from the clothes I made for my daughters. These fabrics are more than 20 years old. I made it about 15 years back and I have been using it for the last 10 years on my bed. The size is a little too big but I did not want to leave a strip out. It is about 7' x 8'. From Ramona: I made this quilt for my niece, Blair, and used bold colors because she loves brights -- the colors remind me of the summer she spent with me. From Nancy: I am just a beginner at quilting, but wanted to challenge myself with some triangles, so I tried a block from a book I have. This quilt is about 50 x 50 inches. Note from Janet: Nancy's wonderful quilt doesn't truly "fit" the squares category, but for now this gallery is the closest match. From Beverly: I made this king size Bear's Paw quilt for a friend who wanted it to look like a "man's quilt," and feel the brown and cream combination worked well for that. From Merle: First I found an autumn cloth, and them one that seems to me like a summer cloth, then spring and winter. In my country (Costa Rica, Central América), we only have two seasons: dry (summer) and rainy (winter), but I like the idea to make for my first bed quilt, this one. I hope you like it. Bear's Paw Quilt Block Pattern in two sizes: 14" x 14" and 35" x 35"
From Jackie: This is one of my very first quilting projects. I searched the Internet for something interesting and fairly simple to make and came across this Rail Fence pattern. The quilt hung on my guest bedroom wall until we had children and now it is folded in half and decorates my hope chest at the end of my bed. From Joni: This was my first attempt at hand quilting. It was fun, but looks better from a distance, lol. From Vicki: I made this quilt for a couple of dear friends of ours. One day, I casually asked each of them what their favorite color was. They both answered "blue." So the House of Blues was born. I wanted to focus on blue but it needed something different so I decided on brown and yellow as contrasting colors. I presented it to them at a Halloween party at their house. They absolutely loved it and Kris said "No one's ever made me a quilt before. I LOVE It." The quilt is 57" x 72". From Alabama: Both of these scrappy quilts were donated to local nursing homes through our church quilt group. I hope they have become a bright addition to someone in the home. From Barbara: I saw this quilt in a magazine and made a few adjustments to the pattern. I love it and have made another in pinks and purple and off white. The quilt measures about 60 by 72. From Robicole: "This quilt top was made as a group -- we each made our own quilts, but encouraged other members of the group along the way." From Robicole: "This quilt was inspired by a quilt I saw in North Carolina. I made this quilt as a sample for the Penny Pincher 7 Quilt Block Swap in the Quilting Forum." From Citlali: "I made this quilt for my baby girl, who loves teddy bears and is mesmerized by the color red. I made snowball blocks with bears and used flowers in the corners. The nine patch blocks are a combination of red, plaid red and white. The back of the quilt is all red. My little girl loves this quilt above all the others she has, and she loves to be cuddled with it and play on it." From Janice: "I wanted to learn the bargello technique, so I just started sewing. This crib size quilt is the result. I made the quilt in 2 weeks during January, 2007." From Annie: "It's not perfect, but this is my second quilt I've made. I made the quilt in April, 2006. I am just 25 years old and I discovered this kind of art only this year. This quilt has a baby bed dimension and it's made of all vintage look fabrics because I like this kind of blend. I made another quilt but this one is my favorite and I keep it for me." From MOMOF11: "This is just one of the quilts I made from 4.5" novelty squares swapped on the About.com quilting forum. The other was given as a baby gift when my camera was not working, so I have no picture. I still have squares left for another quilt or two. This quilt measures approximately 48" x 58" and was donated to a local charity through my guild. One evening of sewing had the top together... a very easy pattern!" From Katelnorth: "All the fabrics in this top were hand dyed either by myself or in a few instance, by friends I've done hand dyed fabric swaps with. I like to use simple geometric settings with hand dyed fabrics, to show off the fabrics." From LindaHoo: "I hosted a swap of pairs of novelty squares, with the intent of making a quilt that could keep kids busy finding the pairs. The swap turned out to be gigantic, and I have made nine or ten quilts with the fabrics! The quilts have been given to family members and to charity." From Momofll: "The first pieces of this quilt were the corner triangles trimmed off when I made a String-X quilt for my son. I sewed 8 triangles together and made 4" blocks. After adding sashings and cornerstones, and the first pieced border, also from leftovers from that string quilt, I showed it to Mom and she loved it.. This was at Christmas time. Mom's birthday is March 15, so I decided to finish it up for that. I promptly put it away in a drawer and forgot about it until March 14! I added the final borders, and decided a plain, single fabric back just would not do...but I didn't want to spend time picking the right fabrics to piece a back. I had recently started making crumb blocks, and had over 100 sitting in the drawer. I used 48 of the blocks to piece the back and added a 3" border to make sure it was big enough. Mom loves the quilt and has decided I must enter it in our guild's quilt show this summer." "This quilt is probably about a crib size. I made it for my sister as a wedding gift. It's made from sheets and some shirts thrifted from Goodwill. The inner squares are raw edge appliqued onto the large squares." From Pam: "I made this quilt for myself. It makes think of summertime." From Clare: "After reading about making Blue Jean quilts and doing a bit of research, I scoured the house for all the old pairs of jeans I could find. I then made a trip to the local fabric warehouse and searched for suitable material that would be heavy enough to match the weight of the denim. This is the result." From Bettie: "This quilt fits a twin size bed and was a Christmas gift for my 6 year old granddaughter." From Bettie: "Quilt is 68 1/2 x 89 1/2, made of 100% cotton scraps. I am a beginning quilter and this was my third project. I started this quilt while living in the country, (I put the top together and didn't work on it for again for 3 years) it was completed on 10/01/2006 for my son's 43rd birthday. I now live in a large metropolitan city." From Roxie: "This quilt is based on a garden theme quilt by Eleanor Burns. I gave the quilt to my oldest daughter, Beth. It's my favorite quilt."